Today is the first day of candidate filing in Missouri for the 2018 election cycle. Candidates for federal offices (U.S. Senate and House of Representatives), statewide offices (State Auditor only this cycle), General Assembly seats (both houses), and Circuit Judge file with the Secretary of State in Jefferson City. County offices file with the election authority in that particular county. 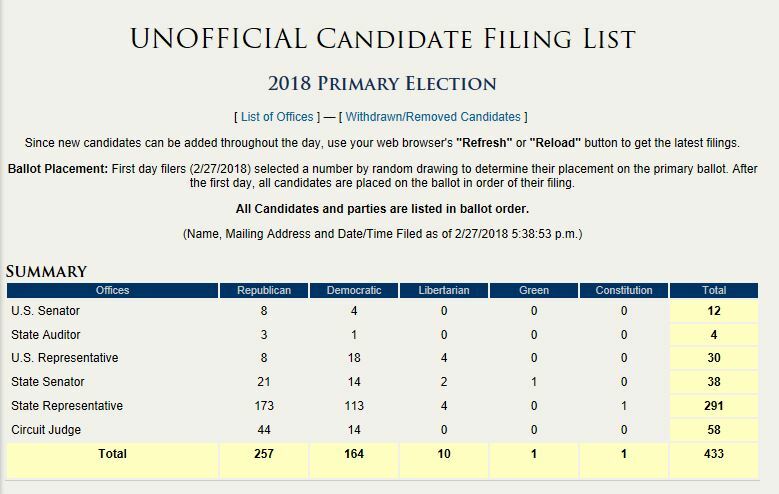 Since new candidates can be added throughout the day, use your web browser’s “Refresh” or “Reload” button to get the latest filings. The last day to file for office is March 27, 2018.